I just bought a Sankyo Stereo 800 off Ebay that listed that it powered on but the lamp and spindles didn't turn. Well upon receiving it today the motor in fact does not power on... explaining why the spindles weren't turning I will most likely be returning it and trying to get a refund. However, before I do that... does anyone know how I can check to see if power is getting to the motor. When I plug it in a light goes on in the front and I hear a slight pop from the speaker...but that's about it. The best way I can think of is to hang a voltmeter on the motor's terminals (assuming you can get access). If you aren't sure which it is you'd need to measure both AC and DC. The motor on the Sankyo Stereo 800 is powered by DC, being electronically controlled. From what you say, Janice, it could be a motor failure or a failure in the electronic board which controls the motor. Do you get any hum from the speakers with the volume knobs turned all the way clockwise? If so, the transformer is working but for some reason the current isn't getting to the motor or the motor might be broken/in need of maintenance (dirt removal, worn-out brushes etc). Perhaps you might re-sell it for parts or sell individual parts after disassembling them. Also the lens might be worth something especially if it's the "PRO ZOOM 1.0" which is quite rare. Thanks Steve...but I'm quite the spaz with the voltmeter. Other than checking for continuity on a couple of things in the past...I don't have a clue to what I'm doing. There are a couple wires going into the motor at the top...but they are shielded and sealed...can't get to the wires. I appreciate the info Maurizio. I did turn up the volume and yes there is hissing coming from the speaker. Also, the lamp wasn't working because it was burned out...put in a new bulb...and nice and bright. So as you said... power is getting to the transformer...just not the motor or maybe it's a problem with the circuit board. I'm pretty bummed about this. It's a beautiful projector...one I've had my eye on for a long time. I thought this was my opportunity. I paid way too much money for it to keep it and sell for parts. I'm going to try and negotiate with the seller. If he hadn't stated that it "powers on" I wouldn't have made an offer. Here are a few pics I took. I really like Sankyo projectors. Somebody with your skills really needs to learn how to use a multimeter: in situations like this one it can answer a lot of questions without making expensive guesses. If you can somehow unplug the motor wires at the far end end measure the continuity between pairs that can tell you a lot. The fat pair is power. This should be very low in ohms. If it comes up in the thousands or millions of ohms the motor is DOA. The skinny pair is probably a motor speed sensor. Your motor speed is zero right now so let's find out if there is power in the first place. -then again, sending the machine back and trying again some other day could be the best way to go too. You can't win them all! Sometimes you can force the test probes from the voltmeter into the black insulated wires at the motor. They don't have to go very far in to make contact. Then test for voltage when the projector is turned on. 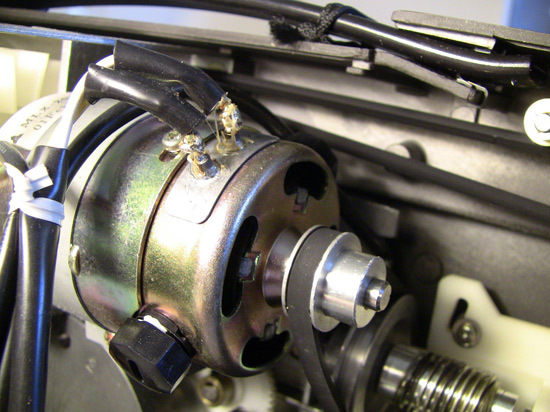 Or you can make a very small slit in the black surrounding the wires at the motor to get a better connection. These motors are designed to last for years. I'm sure you can handle this. Go for it! I agree with you about this projector. It's runs great and is not harmful to films at all. I'd force sewing pins through the insulation, but only if I could clip leads onto them, make sure nothing live is touching surfaces they shouldn't and stand back. Pressing test probes on with your finger tips is no way to figure out it's really a 117V circuit! The machine is very clean inside: looks like it hasn't got a lot of miles on it! I own a Sankyo ST-800 too and its a very good machine! The one you have there looks to be in very good condition and I wouldn't be surprised if the problem is just something very simple. I really wish I was more knowledgable about electronics and could give a better educated answer, but I usually fix projectors by "tinkering" until it works . The problem sounds like it might just be with the switch. Did you try forward and reverse? Does the bulb stay in warm-up mode (dim) until you turn the switch to forward (two clicks) and then bright? 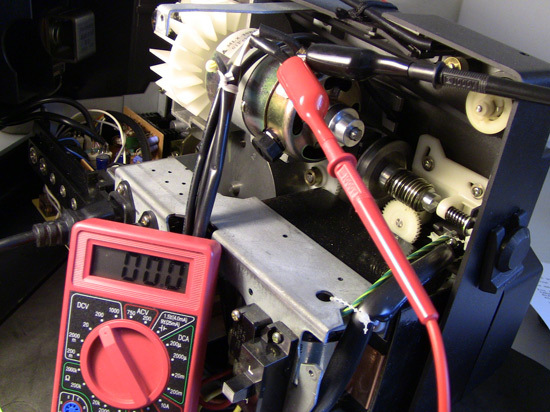 Janice, just pull the two black protection at the end of the larger wires on the motor: this will uncover the soldering points and there you can measure with a voltmeter/tester. I agree with others the machine seems to have seen very little use. Do not be afraid of the electrics going into the motor: it's direct current at 12-15 V, really harmless, considering the skills you proved in other posts of yours. Do not quit. I have the schematics for this specific model, let me have your email and I'll post some scans of the motor control board as soon as I find some moments to do it. This isn't the first time I've heard of motors failing on Sankyo machines. It's VERY rare for Elmo motors to fail, but Sankyo machines are almost common. If you can bear with my learning curve...can you guide me through the first test? 1. First tell me where the dial should be positioned on my multimeter. 2. Next, I know the Black probe is always placed in the common...but I'm not sure about the Red probe. 3. Now where do I place the probes (black probe goes ?...red probe goes ?) and what am I testing? Is the machine plugged in for this particular test? I was able to raise the heat shrink on the two motor wires..thanks for the tip Maurizio. Machine plugged in, set mind on "careful!". The meter dial goes to "200" in the section "DCV"
You take one lead and touch one terminal (and only the terminal! ), take the other lead and touch it only to the other terminal. The only difference flipping them makes is one way the number will have a minus sign, the other it will not. You should see zero(ish) when you expect the motor to be off. You should see something (12V, 20V, 24V?) when it's supposed to be on. Best way to do it is carefully connecting up using leads with alligator clips or EZ hooks, but one way or the other be careful and respect that metal motor case! Shorting to it can cause grief you didn't start out with. I repaired one of these with the same issue two years ago. Check where the transformer leads run to the circuit board. At that point there is a small component called a bridge rectifier. It is small and round. Check to see if it is burned out. It will be obviously damaged. By replacing that and the electrolytic capacitor(50v 1000uf)just after it, I managed to get my 800 up and running. Did this pop a fuse too? I don't remember now but probably yes. Unfortunately semiconductors often pop faster than the fuses that are supposed to protect them. Janice, it's important to take the lamp out while you sort this out. Remember: no motor, no cooling air! Meter showed zero when switched to any on position (forward, reverse, lamp on, sound). I think I located Patrick's. "Flux Capacitor"...OOOPS!... I mean Bridge Rectifier To my eye it doesn't appear damaged. Does the bulb stay in warm-up mode (dim) until you turn the switch to forward (two clicks) and then bright? Yes James...the switch is working correctly for the lamp. You mention fuses Steve...Were you talking about house fuses or projector fuses? I didn't find any fuses in this machine. Are there any? It sounds to me like you are making some progress! I think your motor is not the problem. I'm guessing Patrick's rectifier and capacitor are the power supply for your motor. 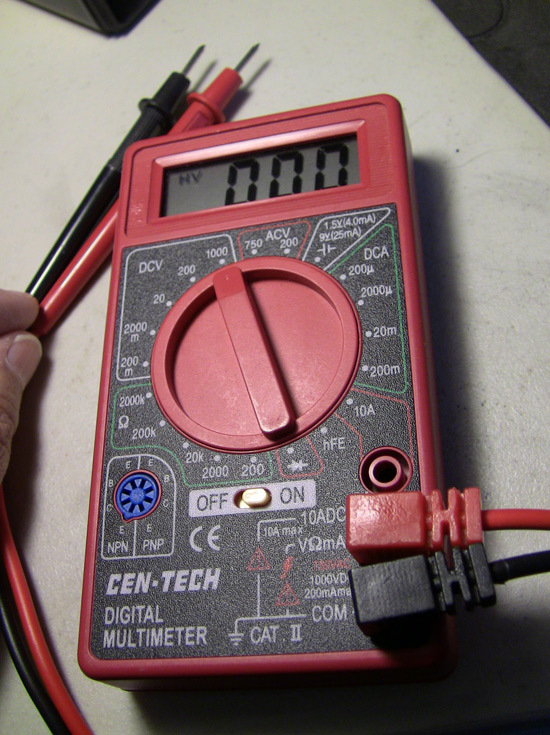 Why not apply your newly aquired voltage measuring skills right on the two terminals of that capacitor? Thanks for all the help. At least there are some nice pictures posted that might help someone else. I'm going to try and return the projector and hopefully get my money back. I have a feeling that's not going to be easy either. The seller hasn't returned my email yet. Maybe you just blew a fuse! 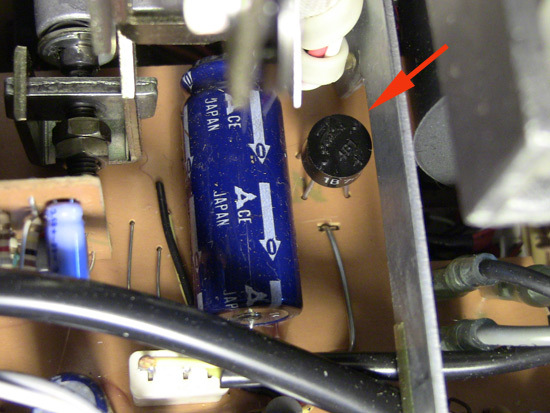 I actually meant you should clip onto the capacitor (large blue part) next to the rectifier. If yout did clip to the rectifier at the right point and saw zero, it means that there is a problem in the power supply circuit. This could be the transformer secondary, the lines (and fuse?) to the rectifier and or that capacitor. Hi Guys! I had an issue with the rectifier myself years ago and from experience I have to say it is not obvious the rectifier looks damaged when become useless, in fact mine looked al right but wouldn't work. Replaced it and voilà everything started to work again. Anyway, Janice I think the problem with your Sankyo is nothing an expert electrician cannot fix. Give me a couple of days and I'll let you have some scans with the schematics. OK? Sure Maurizo...Of course I won't understand the schematics though. I think my email is in my profile...but I'll PM it to you anyway. I have an electronic repair shop located very close to me. I could take it there to see if they could work on it. Steve... At the early stage of my learning curve probably if you had called it the "The Big Blue Thingy" ...I would have known what you ment Oh Well...What's done is done. This projector is definitely worth fixing. I'm just not sure if I'll be able to orchestrate it. Well...looks like I'm keeping the projector. The seller finally responded after 5 days. He offered to refund half my money back. That amount still made this an expensive doorstop...but I accepted the offer. Maurizio was kind enough to send me the schematics. Perhaps I can find someone willing to work on it. Thanks everyone for helping me out and if you know of someone who might be willing to fix it...please let me know. Doktor Frank, are you out there? There is a damsel in distress! I can help you out once I get home this weekend. We can test some voltages at various points around the boards and find out where the problem is. I have a big list of expected voltages from when I repaired my one years ago.